Bred with race boat DNA, the Hunton H55 was born to run. The Hunton H55 aims to package stability and speed for boaters looking to cruise in comfort. The British company was established in 1979 as a producer of offshore race boats. Today, Hunton looks to its racing heritage when designing boats that have stayed true to the geometry of a racing hull. 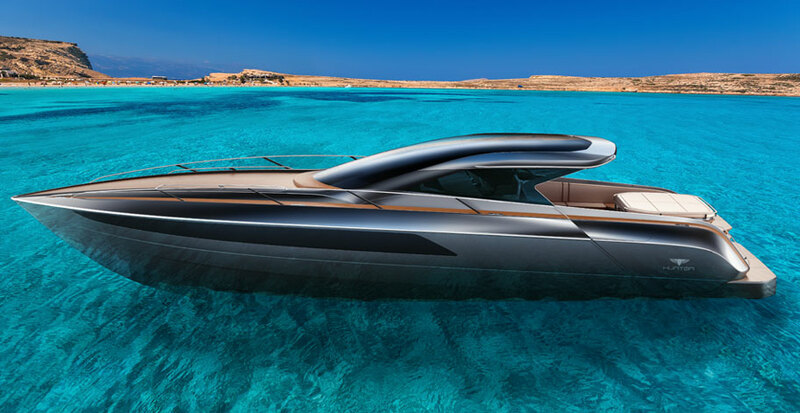 The 55-foot Hunton will be the company’s largest yacht. The hull design is met with luxurious touches typically found aboard superyachts. The digital fly-by-wire joystick control assures easy maneuverability, even in tight marinas. The yacht also features a gyrostabilizer, a panoramic hardtop with tinted glass and a custom tender. Hughes describes the interior as “British-refined with a hint of Italian and some American flair.” The salon area has seating to accommodate up to six for dinner and features an electronically convertible dining-to-coffee-table-level hi/lo table. The master suite has a queen berth, while the guest berth features single beds that can swing together, making the space ideal for children and couples alike. With comfortable accommodations, an abundance of natural light below from the hatch and port light, and luxury features—including a hidden wine cooler—the yacht’s livability is unquestionable.